Updated (2012-02-04): Updated to Bash 4.2 and included source code used to compile. 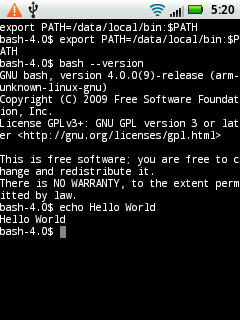 GNU Bash (the GNU Bourne Again Shell) is the standard shell on most desktop and server distributions of Linux. As a result, we can download bash source code and compile the Bash shell for use on Android devices to replace default /bin/sh and busybox sh. Since the Android NDK doesn’t support the full glibc library (it lacks /etc/group and friends), a small patch is required to compile Bash for Android 2.x devices (probably caused by changes since Android 1.5.x). If you don’t feel like compiling from scratch you can download a pre-built version. Of course, once you have it ready and set up you should probably create a “.bashrc” file to make the terminal a bit more bearable, if you wish to. What version of BASH was this patch suppose to be run against? where is the source ??????? It should run on all versions of Android, as far as I am concerned.